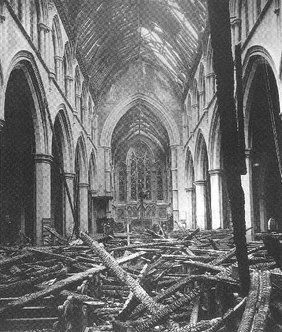 Fire-bombs caused very serious damage to the fabric of St Mary Abbots in March 1944. Although the nave and chancel roofs were destroyed and damage done to stained glass and the organ, the main structure was not seriously harmed. There is a story that while the fire-fighters fought the blaze, an air raid warden plaued the organ to keep the water out of the pipes thus perhaps preventing more serious damage. The Church was temporarily repaired to allow services to continut; and in February 1956 a service of thanksgiving was held in the restored Church. St Paul's Church in Vicarage Gate, a daughter church of St Mary Abbots, was also gutted in the war but was not rebuilt.